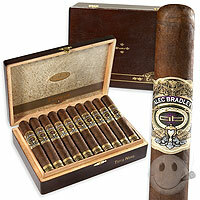 The Tempus was given to me by a friend who told me that it was good, but not as good as the Prensado. I think that I will have to agree. The Tempus is a nice box-pressed stick, about the size of a corona. It started a bit spicy but smoothed out very quickly and produced a woody, most oak, flavored taste. It was smooth yet flavorful, but not overpowering. I did notice that once I got down to the band, the smoke started to get hot. I was disappointed with this because I wanted to smoke it down farther than I was able to. But I still enjoyed the smoke and would probably pickup a few more sticks if I can find them on sale somewhere.